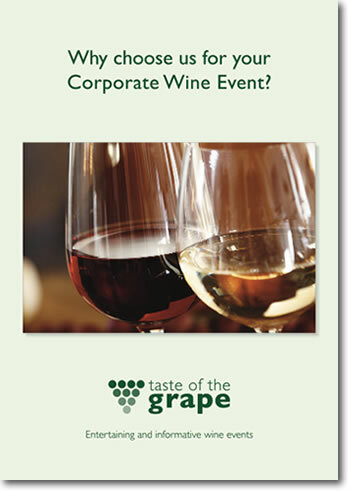 Through my business Taste Of The Grape I run informative and fun wine tasting events for any occasion from small private parties to large corporate events. My emphasis is on making such events enjoyable and accessible to everyone attending them. My corporate wine tastings and events are ideal to celebrate achievements, round off conferences, or to help with team building. Participants can relax and enjoy delicious wines, great entertainment, and a bit of competitive fun. I can also run wine tastings for private clients – introducing and explaining the wines with a special meal, or running a whole event for a group of wine lovers. “ I just wanted to drop you a line to say thank you for a really fun evening. The feedback has been great. Everyone really enjoyed themselves – there are more than a few sore heads in the office this morning. Great wine, great cheese and a great host! "The evening was a great success – everyone loved it, particularly the clients which was of course the key to its success"
"Thank you very much for last night. I’ve had some brilliant feedback from the rest of the team."
"On behalf of the whole team I would like to say thank you for holding such a brilliant event! You handled the large group very well and I know that everyone really enjoyed it." "Thank you so much for the amazing evening you ran. Everyone really enjoyed it and had a blast! Huge congrats to you and your staff"
"The evening was a great success and we received very positive feedback from our hosts and guests on the wine tasting element. We definitely hope to work with your company again"
"What a thoroughly enjoyable evening! The selection of wines you served were quite delicious and the evening was brilliant fun. Whilst educational for those of all levels of experience, enjoying a glass or two with a competitive edge was great. Thank you again." "Wine experts Taste of the Grape ran a no fuss, educational session on European wines. It was perhaps the best cheese & wine pairing I’ve ever had the pleasure of tasting, my favourite being a sharp goat’s cheese with a depth that was heightened by the level of acidity of the sauvignon."